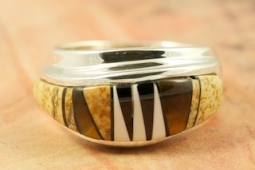 Stunning Ring featuring Genuine Picture Jasper, Tiger's Eye, Magnesite and Black Jade inlaid in Sterling Silver. Designed by Navajo Artist Calvin Begay. Signed by the artist.